What is natural climate change? This important chapter is dedicated to the late Dr Joseph O Fletcher who made some astounding discoveries about the main drivers of climate, in a quest to understand what is natural and what is not. 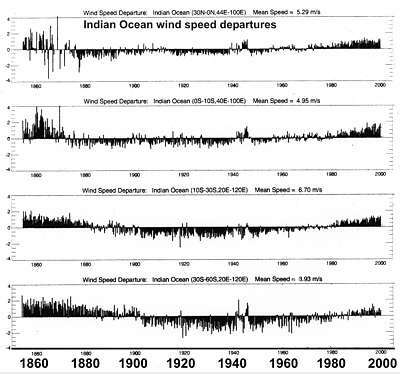 From sailors' data going back to 1854, it became evident that winds change strength and that this has a major influence on climate everywhere, even on sea levels. Indeed the observed and feared climate change can entirely be explained this way as also predictions can be made. How this chapter came about and an introduction to each sub-chapter. When we want to understand natural climate change, we must go far back in time and look for a signal that is found everywhere over every ocean while completely consistent and in accordance with observed climate changes. What could that be? Global circulation is easily explained in theory but Earth's geography throws a spanner in the works, such that it is not possible to understand Earth's natural climate without understanding the enormous differences between the two hemispheres. 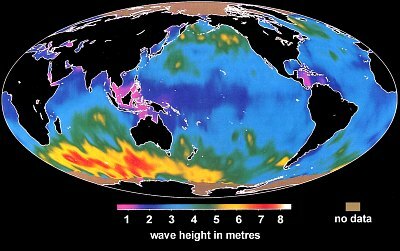 The Tropical Warm Pool in the west Pacific ocean is the world's most important climate process, causing deep convection and distribution of heat. Some dishonesty exists in not reporting the sea levels around the poles where winds cause these to sink while pushing sea levels up everywhere else. Dr Joseph Fletcher's seminal lecture in July 2000, as transcribed from video below fletcher.htm. Important reading! Obituary to Dr Joseph Fletcher. http://sharpgary.org/JOF%20Obituary.doc. This global climate chapter is very exciting because it deals with an important mechanism that has been overlooked or insufficient attention paid to. It is based on the work of the late Dr Joseph 'Joe' C Fletcher, known for his arctic research. Working for NOAA, he was OAR Deputy Assistant Administrator for Labs and Cooperative Institutes. Joe retired in 1993 and moved to Sequim WA where he passed away on July 6, 2008. Dr Gary Duane Sharp was a good friend of Joe and even organised a seminal lecture as part of his Maestros Legacy Lecture Series. This 100 minute lecture was filmed, and I proposed to have it transcribed and converted to HTML, for the world to read in perpetuity. Don't miss it! 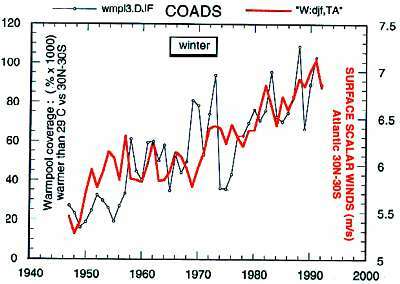 To investigate this, he based his research on the COADS dataset (Comprehensive Ocean-Atmosphere Data Set) held by NOAA, to which he had access. 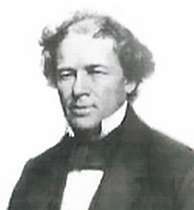 This dataset was begun by a far-sighted individual, Matthew Fontaine Maury (1806-1873) who at that time headed the hydrographic office and built the sailing charts to help mariners sail at various places around the world. He realised the value of accumulating a dataset which would really document the behaviour in all the oceans. So in 1854 all the participating countries agreed on when to take observations, how to take them, how to archive them and so on. And this has been going on now for almost 150 years up to the present, resulting in over ten million observations which provide us with a good documentation of just what has been happening at the ocean's surface in all parts of the global oceans. The complexity of the climate system has been described by many people including such great scientists as Einstein and Von Neumann, pointing out that the ocean drives the atmosphere, and the atmosphere drives the ocean, and that the interactions occur on all time and space scales, with nonlinearities and thresholds and that the representation of all these interactions, are almost beyond comprehension. The simplicity is that nature knows all the rules, and knows all the boundary conditions and knows where the mountain ranges are, deep ocean ridges and trenches, and the rest of the geography, and nature's answer to that question is this average picture of winds (wind field). When you think of it in a holistic sense, you can think, if whatever is forcing this system, if it changes in magnitude, you can expect that the whole pattern will wax and wane in unison. And that is exactly what the observed record is showing as here with the wind field. As the forcing increases, the highs become higher, the lows lower, winds stronger, and vice versa. Not surprisingly, this is precisely what this chapter aims to do. First we'll look at some of the most popular signals like ENSO, AMO, PDO, to conclude that they do not make it. But what Fletcher discovered was the consistency and the enormous change in the wind field (wind speed), and this needs further study. But already major predictions (that have come true) can be made. To understand the winds and barometric pressures, we need to understand the general global circulation and the differences between the two hemispheres which creates an entirely different situation. Joe Fletcher pays much importance to the Tropical Warm Pool, and how it works as the greatest climate phenomenon on Earth. In the end, we do not know where the main fluctuations come from, but it must be either from changes in sunlight or from an irregular out-radiation of Earth. To begin with, one must understand that there are major and important differences between sea and air, as shown below. Thus the sea is Earth's main heat storage whereas winds are its main weather and climate motor. Ocean currents are slow and superficial. Winds are fast. The conclusion is that Joe's hypothesis is probably right, as one does not need Anthropogenic Warming to explain what happened in the past 150 years during the Industrial Revolution, because the changes in wind strength explain it all. Winds also have a major influence on sea levels, year to year, decade to decade and on a century scale. Because modern sea levels are derived from satellites that do not measure the polar seas outside 66º N and S, a crucially important part of the oceans is excluded from observation. One can say that the Anthropogenic Global Warming (AGW) fear is based on a truly global signal, the concentration of carbondioxide in air, which can be measured everywhere, with the same or similar results. Such a signal must influence the climate everywhere in a similar way (warming), but this has not been found. Global temperature has been swinging but not in rhythm with the CO2 signal. So could there be another signal, also global in nature but more in tune with observed temperature swings? In other words, does a global signal exist that explains all natural temperature swings? For it to have any meaning, it must be found everywhere with the same characteristics, and also be reliable and extend far into the past. In this graph we have brought some global signals together, that are on and off the flavour of the time. All signals have the bottom axis as zero, except for ENSO, AMO and PDO which are relative to the brown scale on right. There is ENSO (El Niño Southern Oscillation) also called SOI (Southern Oscillation Index), here the purple scribble, which is derived from a difference in air pressure from east to west equatorial Pacific. Due to local barometric pressure swings, it is very noisy, but related to how much water is pushed into the Tropical Warm Pool in the west equatorial Pacific, even though it does not swing in unison. Reader note that the average global temperature is not shown here because it has been corrupted to such extent as to be entirely unreliable. The Tropical Warm Pool in light red, represents the pool of water warmer than 29ºC and because of this, capable of causing thunder clouds and deep convection into the highest reaches of the troposphere, transferring a massive amount of latent heat into the atmosphere (see later). The red curve above is its average, but is unreliable before 1900. Notable is the extreme rise between 1970 and 2000 from 100 to 170 (lefthand red scale), or an unbelievable 70%, which is hard fact. The green squiggle in the graph above, represents the surface wind strength in the South Indian Ocean, the world's weather power house. Winds here blow on average at 9m/s (20MPH, 32km/h), with substantial year to year fluctuations and a huge 150-year swing of 30%. The average wind speed over oceans is 6.5m/s with enormous geographic variation as the wave height map shows. Remember though, that wave height is proportional to the third power of wave wind strength. The map shows very calm areas in magenta and the Warm Pool as poor in wind. Notice also tall waves near Canada and Greenland. Also shown in the global signals graph is the average of the Indian Ocean (partly shown), which follows the southern winds in phase and pattern. The question is now: what about the other oceans? 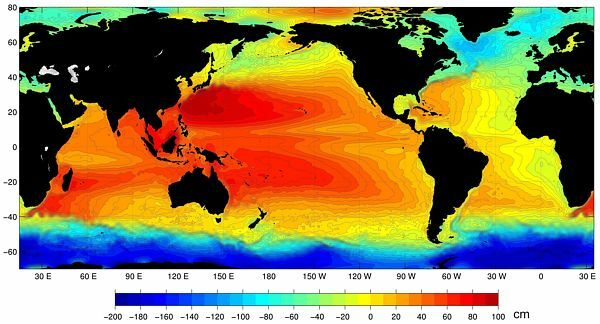 Sea Surface Temperature (SST) maps are usually shown in false rainbow colours, but when their isotherms (points of equal temperature) are plotted, a picture emerges with more information as shown here. Where these isotherms are close together, a steep gradient exists, inviting strong winds and a highly variable climate. Fortunately nobody lives in the Southern Ocean south of Africa, but in the NH three areas are battered: east Canada, Japan and west Mexico. Please note that these curves were not obtained from satellites but from actual measurements on ships (COADS). 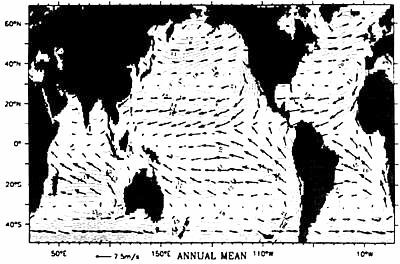 The sea wind is indeed a universal global signal because all oceans follow the same pattern and the same deviations for over 150 years. 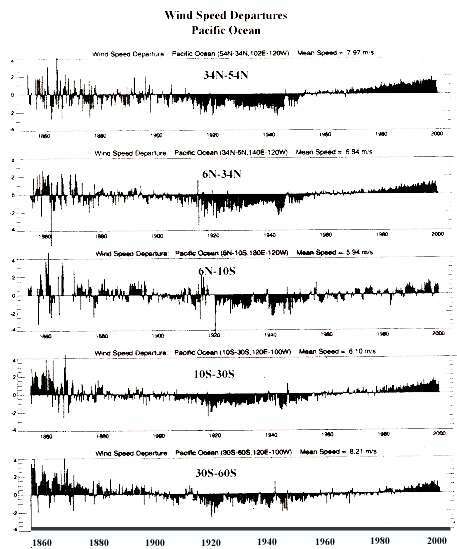 The wind signal is large, because the 150 year swing[see box below] of 25-30% is equal to a swing in solar forcing of 30-50W/m2, whereas the world is in panic about 3W/m2 in a century (IPCC)! Dr Fletcher calculated the periodicity of the wind cycle at 170-180 years but on 19 october 2012 a massive dust storm over central USA reminded us of the "Black Sunday" dust storm of 14 April 1935, suggesting a periodicity of 77 years (about half of 150), and a repeat of the "dust bowl" droughts of the 1930s with severe loss of topsoil and harvests, for years to come.This occurs just as a large part of the corn harvest is diverted to ethanol production.Note that another recent dust storm happened in Arizona on 5 July 2011. 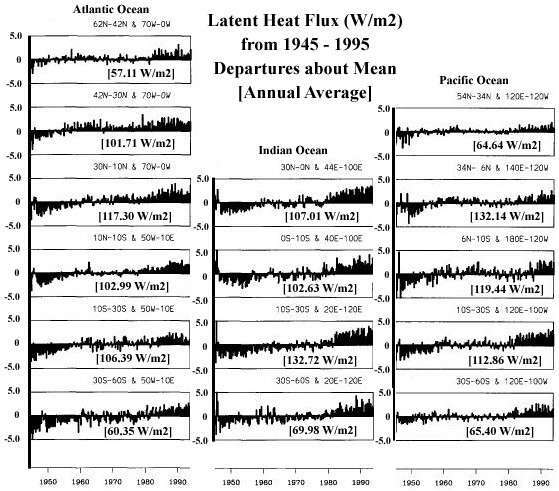 The latent heat flux (=flow) in all oceans (1945-1995) follows the same pattern and is also a global signal. [click for larger picture] Note that heat flow (flux) from the sea is mainly latent heat (evaporation), which depends on both temperature and wind speed. In the cold seas it is around 60W/m2 and in the tropics 100-130W/m2. 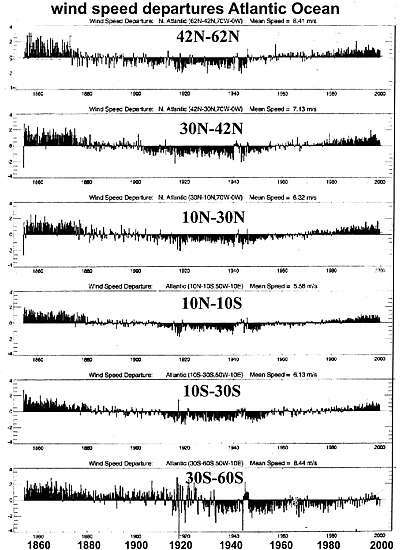 Protagonists of AGW would say that these graphs are a sign of global warming, ignoring that winds have followed the same pattern and that evaporation is proportional to wind speed. Between 1977 and 2003, average ocean evaporation increased by 11 cm per year from 103 to 114 cm per year (10%). This was caused by an increase in average wind speed of 0.1 meters per second [Yu, 2007]. But hang on, one cannot have such large swings in energy without also a corresponding swing in sunlight. Since the sun is considered a constant light source with, give or take, 0.1W/m2 fluctuations (the solar constant), what is the story? Remember that sunlight arrives with an intensity of 1368W/m2 which averages out at 342 W/m2 due to day/night and summer/winter. So 30 W/m2 variation is enormous. Is that reflected in climate and weather, temperature and wind? There exists as yet no reliable method to measure past fluctuations in sunlight arriving at Earth's surface, even though the new radioactive Beryllium-10 method looks promising . The very light metal Beryllium occurs in the atmosphere as it is created from cosmic bombardment of larger molecules like nitrogen. As it dissolves in rain drops, it settles out on Earth's surface where it gets enclosed in ice and sediments. But the technique is young, its signal small and its interpretation uncertain. In the graph (Beer et al. 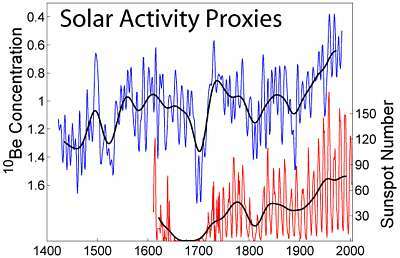 1994) is also shown the sunspot activity (Hoyt and Schatten 1998), which in 1650-1750 caused deep cold (the Maunder Minimum or Little Ice Age). A new minimum after 2010, appears to be coming. Note that these curves are not in agreement with the wind pattern. and the reverse, winding it down again. The frequency of such an oscillation depends on the inertia of the whole, in this case the oceans. Then a +30% and -30% cycle in 170 years amounts to only 0.3-0.4% per year which is indeed undetectable. Some support for the notion of reduced Outgoing Longwave Radiation OLR comes from a computer model by Pierrehumbert, the results of which are graphed here. Horizontally the temperature of the surface in Kelvin, and vertically the outgoing IR radiation. rh means relative humidity. The top solid black line treats the surface as if it were a black body, radiating out according to the Stefan-Boltzman equation. If the air contains moisture, OLR reduces because water vapour absorbs OLR. The more water vapour, the less OLR. Note that 273K is 0ºC and the Warm Pool of above 29ºC is to the right of 302K. Here moisture can make a 30% difference, supporting the notion that increased winds, cause increased evaporation, causes less OLR and more warming of air. Thus OLR can vary considerably over time and place, and is definitely not constant. In theory, changes of up to 30% can even happen on a yearly basis, but is not likely. Smaller yearly changes become more likely. Reader please note that the above graph comes from a computer model which assumes that the surface cools by re-radiation and evaporation, which is false. It just subtracts the heat of evaporation from the Stephan Boltzman black body radiation. But the surface cools mainly by conduction and convection, plus evaporation. The above curves are still useful to see how quickly evaporation becomes significant as the water warms above 300K. Note also that the effect of wind is irrelevant in this graph because it is only about heat transfer. The effect of wind is mainly that the bottom curve (saturated air) becomes dominant. So the bottom line is that we cannot show where the energy came from to cause such large swings in wind strength. We just need to accept for now that it is real and not altogether impossible, and figure out how the rest of the climate system reacts. faster transport of heat over the world and deeper into the continents, through the atmosphere. faster ocean currents and heat transport through the seas. rising sea levels because Antarctic westerly currents push down the Antarctic trough while pushing up the sea level everywhere else down-wind ('rising seas'). See Chapter4/sea_levels. more evaporation because evaporation is primarily proportional to wind speed: more wind, more water vapour. more rains, snow and clouds that also reach deeper inland. less droughts. Thus overall better conditions for farming. cooler sea surface because evaporation cools the sea. before 1900 the world was a wetter world with good crop growing conditions. 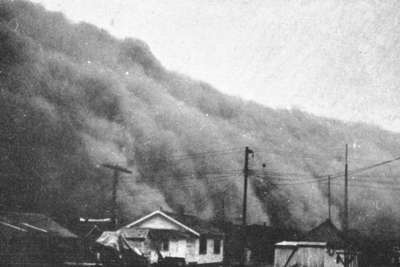 during 1920-1940 the winds were slowest, corresponding with the Dust Bowls, universal droughts and famines. we've come to the end of fast winds and begin to dip towards slower wind speeds. the right side of the graph almost joins up with the left side. It is a large cycle (174-year, see further) and we can expect a repeat of the 1850s. More about radio-dating with Be-10 in Chapter 3. 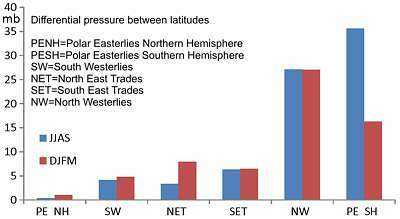 The world's climate system cannot be understood without understanding the differences between the Northern Hemisphere (NH) and the Southern Hemisphere (SH), neatly summed up in the table below..
Has sea mounts and ridges under water and a very large continental shelf (light blue) Has mountains and volcanoes and a very small continental shelf. Here the global climate zones are shown in colours from left North Pole to right South Pole. Superimposed are temperature curves for the northern summer (red), average (green) and the southern summer (blue). Although both hemispheres behave quite similarly, it can be seen that the NH warms up in summer more so than the SH, while also becoming colder in winter, even though average temperatures are quite similar. In simple terms, the NH has a land climate (more extreme) and the SH a sea climate (more equitable). This diagram simplifies global atmospheric circulation as if it were symmetrical for both hemispheres. 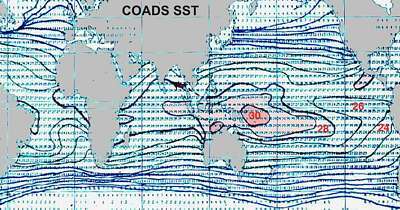 Around the equator, trade winds blowing E to W converge to a weak equatorial E-W flow and corresponding ocean currents (ITC= Inter Tropical Convergence). 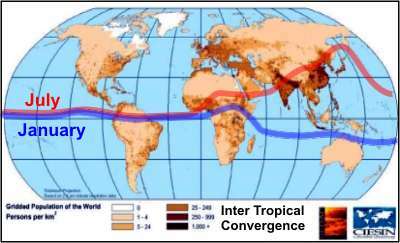 The convergence (clash of winds) causes air to rise, releasing heavy rain, travelling poleward and descending in the subtropic highs as very cool dry air, creating the desert zones of the planet. This is called the tropical Hadley circulation which spirals E to W around both sides of the equator. There is a counter flow in the upper troposphere in the form of jet streams. In the temperate climate zone, winds are dominated by the Coriolis force which deflects to the right on the NH and to the left on the SH. The winds here are mainly westerlies and they are very strong. Finally around the poles exist the polar Hadley cells, with strong winds spiralling around the poles in an E-W direction. We will now see that this narrative is not true in the real world. This map shows the average situation for the northern summer. A deep low exists over east Asia and persistent highs over both oceans. The mountain ranges separate the Asian low from the Atlantic high but cause strong winds on the Pacific side. On the SH there is basically only one deep low over the Antarctic and (4) highs circulating around it. Note that the Intertropical Convergence (clash of winds) runs just north of the equator on the west, but very far north over Africa, India and China. The map shows where people live, and their densities. It also shows the extent of the Inter Tropical Convergence zone which travels from the July curve (northern summer, red) to the January curve (northern winter, blue) and back each year, with variations in its extent. Where winds meet, air rises, causing rain. The ITC is essentially a rain band, which means that the people living between red and blue bands, experience two rainy seasons each year, which is most beneficial for agriculture and thus for humanity. About half the world's population lives here (dark colour). The other half lives in the temperate zone where annual evaporation equals rainfall, thus retaining ground moisture for agriculture. In between these two areas extends an arid zone where few people live. To the north (60ºN) and south (50ºS) it is too cold for plant productivity, reason why very few people live there. Looking at average barometric pressure, a huge difference is found between the two hemispheres. The graph shows how the northern winter and summer do not differ very much but south of 40ºS, barometric pressure tumbles into a consistent ever-present deep Antarctic low. This steep gradient forms perhaps the motor of the world's climate system, with very strong winds unobstructed by mountain ranges.. When the above barometric pressure is plotted as differential pressure between latitudes, it looks like this bar chart, the blue bars for the NH summer and the red bars for winter. The differences in barometric pressure, or the gradient in pressure, is what drives the winds. As one can see, the Southern Hemisphere has a huge wind field compared to the Northern Hemisphere. Strongest winds occur around Antarctica in the southern winter JJAS. These two graphs from Fletcher show another dramatic difference between the hemispheres. The blue curves correspond to the northern summer and the black dashed curves to the winter. Potential energy corresponds to sunshine which has a predictable swing for the NH but a steep decline in the SH due to cloudiness and ice albedo. Watch how ground albedo and cloudiness make the SH more reflective than the NH (righthand image). 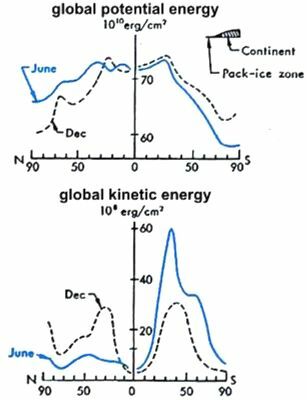 But most of the difference is found in global kinetic energy (winds) which is roughly as expected for the NH but quite different for the SH, with a strong peak at mid-latitudes. In the SH winter, when the contrast is greatest, the NH summer, the kinetic energy is roughly five times greater than the NH. For the year as a whole it is somewhere between 2 and 3. The tropical spiralling Hadley circulation is also a bit more complicated, as shown here along the equator. The yellow humps are from right to left the Andes, the Indonesian/ Papua New Guinea mountains, the African mountain ranges and the Andes again. Over the equatorial Pacific, a text-book Hadley circulation with its Walker component as shown here, blowing E-W over the sea and W-E through the troposphere. On the left, the equatorial Atlantic also follows this textbook scheme, but in-between are two opposing but weaker cells, one over central Africa and another one over the central Indian Ocean. The most important fact is that rising air over the Amazon causes high precipitation and even more so over the Indonesian archipelago where the tropical Warm Pool is found. This large pool of warm water is capable of producing thunderstorms with air rising to the top of the troposphere and thereby influencing the climate everywhere as it has to come down somewhere. 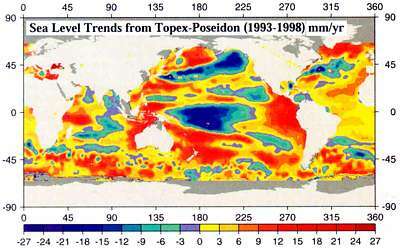 Consistently warm water is found in a large area around the Indonesian archipelago and Papua New Guinea as shown here. This is the source of most of the heat circulation. Also shown in deep blue are the cold subpolar oceans where the heat must go to. 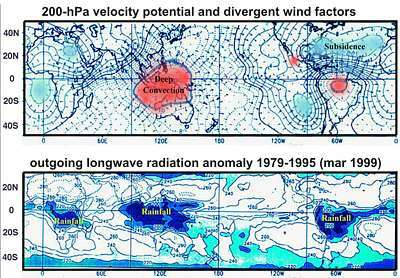 The Tropical Warm Pool is the only place on Earth capable of producing deep-convective (high rising) winds, loaded with moisture, and capable of reaching the upper troposphere and releasing its heat thus high in the atmosphere. But it can do so only if a) ocean surface temperature exceeds 29ºC and b) if the Warm Pool is large enough to allow this to happen. As these graphs demonstrate, the size of the Warm Pool correlates well with wind speed. 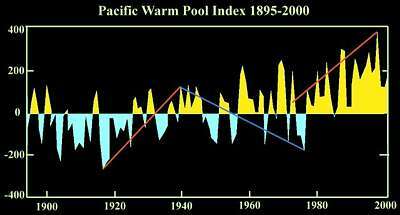 Note that the Warm Pool index is easily calculated from satellite sea surface temperatures (SST) by counting the number of 4x4 degree cells warmer than 29 degrees C. Although there is no long-term record of the TWP, it has been following the wind pattern since 1950 but less so between 1900-1950 for which no satellite data exists. The TWP is often depicted as shown here, with excursions from an 'average'. So please note that the blue and yellow shapes are not opposites and the curve should really have been shown as above. But it agrees with the temperature swings found in the meteorological record: warming between 1920 and 1940; cooling between 1940 and 1970; warming between 1970 and 2000. It is a reliable record of weather phenomena like the El Niño/ La Niña cycle as it is based on actual sea temperature and one of the most important drivers of global climate. It is much more reliable than the ENSO graphs which are derived from barometric pressure differences. 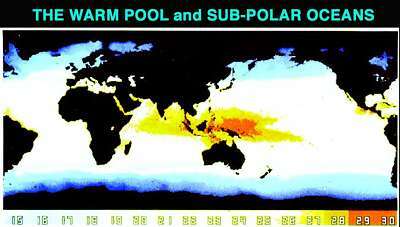 GIF animation of the size of the Tropical Warm Pool by decade 1900-1984. This movie shows by decade the changes in the size of the TWP. Decade by decade it has been increasing steadily since the beginning of last century. 'Global warming'? These two maps show the areas of deep convection (high rising rains), the TWP and the Amazon basin, even though the Amazon basin does not have as much water to evaporate. The blue low pressure areas are where most of the winds subside, over the African desert and in oceanic doldrums (areas with little wind). 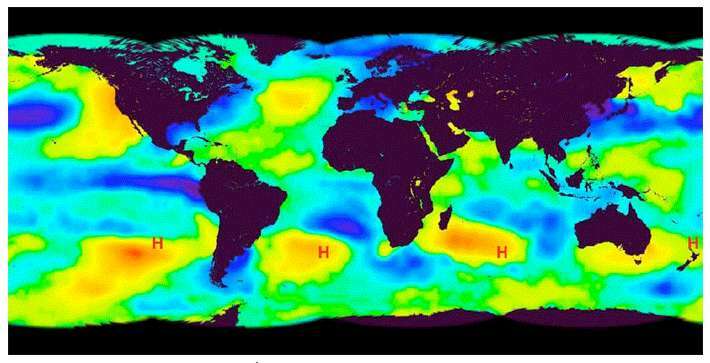 The bottom image shows where most of Earth's heat is radiated out into space, corresponding with rain in areas of deep convection, the rising parts of Hadley cells. Of all these, the Tropical Warm Pool is of most influence. It also shows that out-radiation does not happen equitably all over the planet, but in places where it 'bursts out' due to deep convection, thus supporting the idea that surface cooling happens by conduction, convection and evaporation whereas in the upper troposphere infrared outradiation begins. Thus Earth's out-radiation is not constant but subjective to changes of 15-25% per decade and 30% per century. This process is highly sensitive to the behaviour of winds. We are used to hearing alarmism based on rising sea levels as shown here on this map based on observations from the Topex/Poseidon (T/P) satellites. T/P flies in a groundtrack that repeats every 10-days and goes as far north and south as 66º latitude. This means that it samples approximately 400,000 points over the ocean every 10-days. "The global mean sea level rise observed by Topex/Poseidon amounts to 2.5 +/- 0.2 mm/year between January 1993 and December 2000 ". We are not told that it leaves a crucial part of the global sea level out of sight, and the complete picture is quite different . When the sea level of the whole of the world is shown, it turns out that a deep trough of 2 metres deep (6.5 FT) surrounds Antarctica. This sea level depression is caused by fierce winds circulating eastward and driving a strong west to east current. Due to coriolis forces, which are strongest near the poles, this water is pushed towards the equator where it piles up (Ekman spiral). Note also that a large difference exists between the east and west of the Pacific ocean. Thus sea levels depend to a large degree on wind strength and if there were no wind at all, the sea level would sink by 1m in the west Pacific, 0.3m at San Diego east Pacific, and rise by 2m around Antarctica. In the past 150 years a swing in wind strength of 30% has been observed, leading to corresponding changes at coastal sea level stations. It is often claimed that most (90%) of all sea level moored buoys report a rise in sea level, which is right because all these are located in the yellow to red areas of the map above. The other 10% are located in the blue to green areas (but many not functioning). So we need to be very suspicious of such claims. These two graphs of sea level change, are from Pohnpei in the Western Pacific and from Baltra in the Eastern Pacific. As you can see, they are inversely related. When the level goes up in the east, it goes down in the west, as can be predicted from wind strength. The blue curves are from Topex/Poseidon satellites; the red ones from tide level gauges. The sea level at San Diego gives us a long-term record. From a flattish beginning around 1910, it rose and then flattened out from 1990 on. This 0.2m rise corresponds with the global wind pattern from the COADS dataset. Cabanes, Cecile et al. (2001): Sea level rise during past 40 years determined from satellite and in situ observations. Science 2001;294, 5543.